After all the diversions around Languedoc Roussillon with my 7Cs it’s time to refocus on the vineyards of Mas Coutelou. March was a warm month and other than a couple of rainy days it was fairly dry which together with regular strong winds meant that the soils themselves became quite dry. 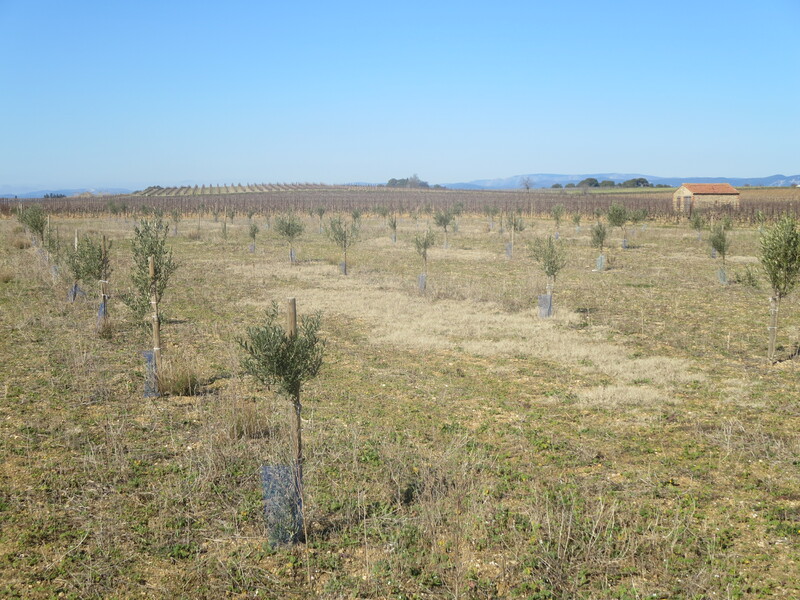 Certainly Jeff reported that his olive trees, of which there are many (see vineyard portrait), were showing some signs of stress. They too were pruned this month. After more than two months of back breaking work Carole completed la taille. 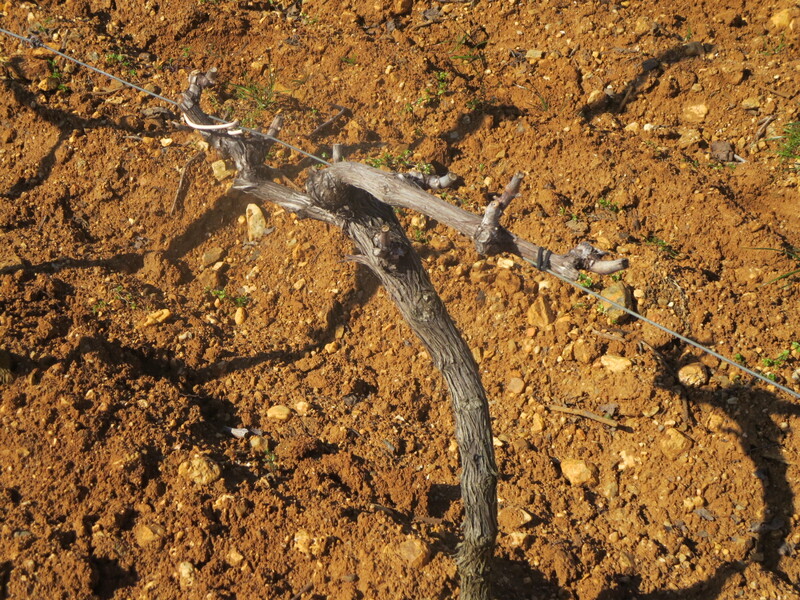 It says so much for her skills and hard work that her meticulous pruning was finished early. She chose to leave the lovely gobelet vines of Rome vineyard until last as, like me, it is her favourite parcel. See her at work here. 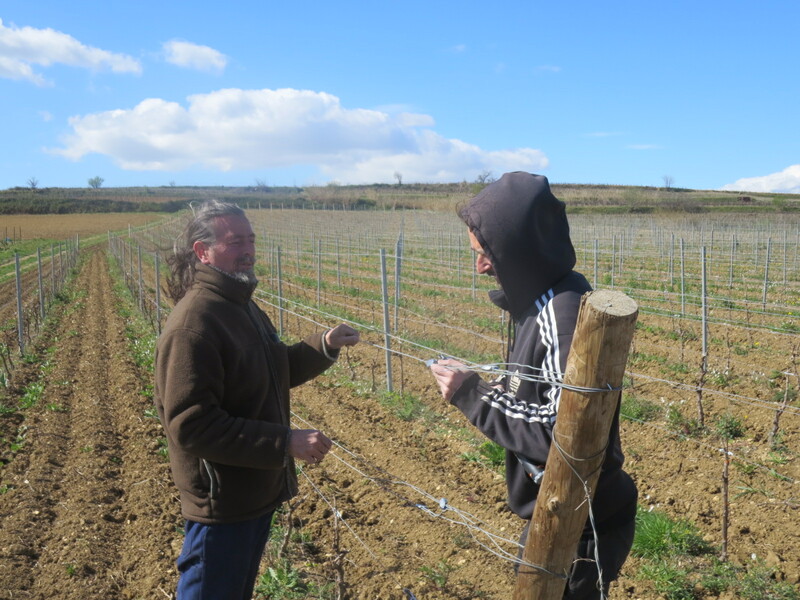 I have already written about some of the other March tasks in planting old varieties of grapes in Peilhan vineyard and in bottling some of the lighter cuvées such as PM rosé and 5SO. Note that light is a general comparative term, both wines are on top form. 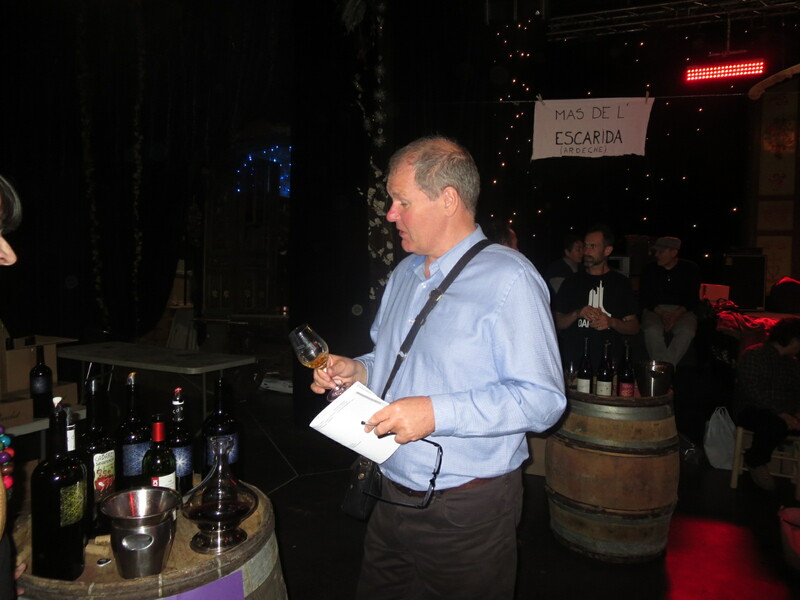 A number of wine salons were attended, eg in the Loire and recently in Arles, a tasting I shall be writing about soon. A second ploughing has been taking place the last few days as the drier weather allowed easier churning and less risk of compacting the soil. 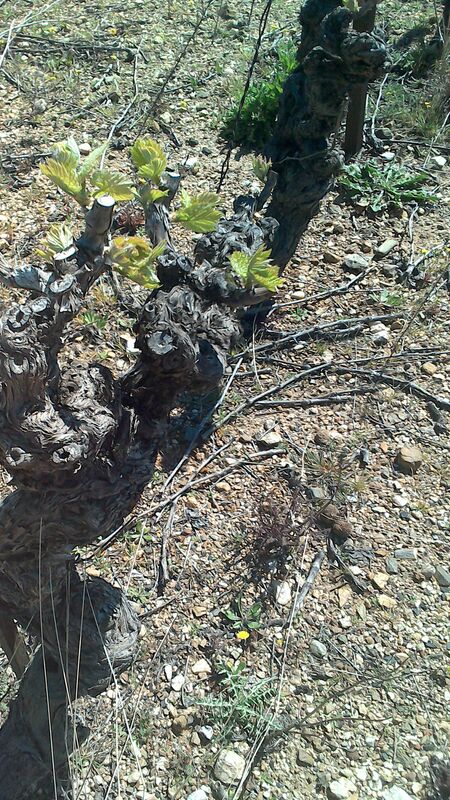 In many parts of the Languedoc the vines are starting to debud, the leaves are showing through. It is a beautiful sight to see them shooting away like this, life returning to the vineyards and the promise of a great vintage ahead. Fingers crossed. 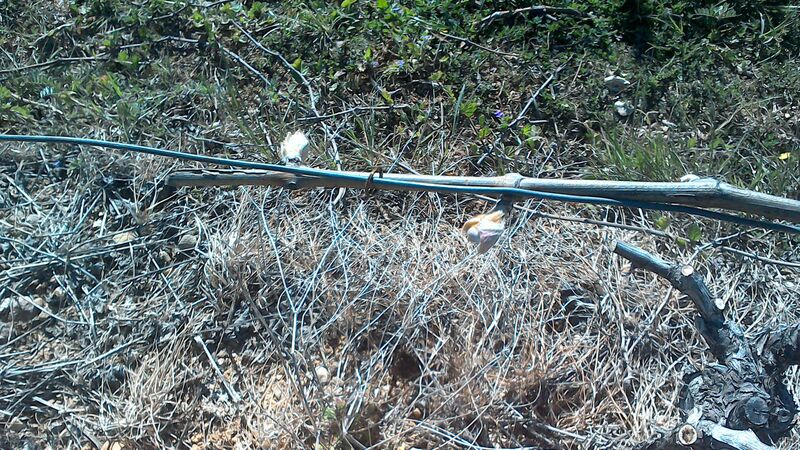 Some buds on a guyot trained vine are just about to burst out. 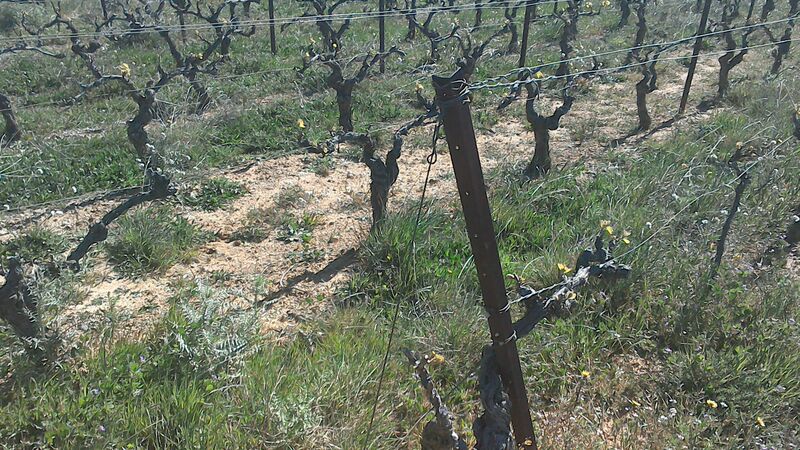 In Puimisson however, the vines are just being a little more timid, apparently unconvinced that winter is not still holding a surprise in store. 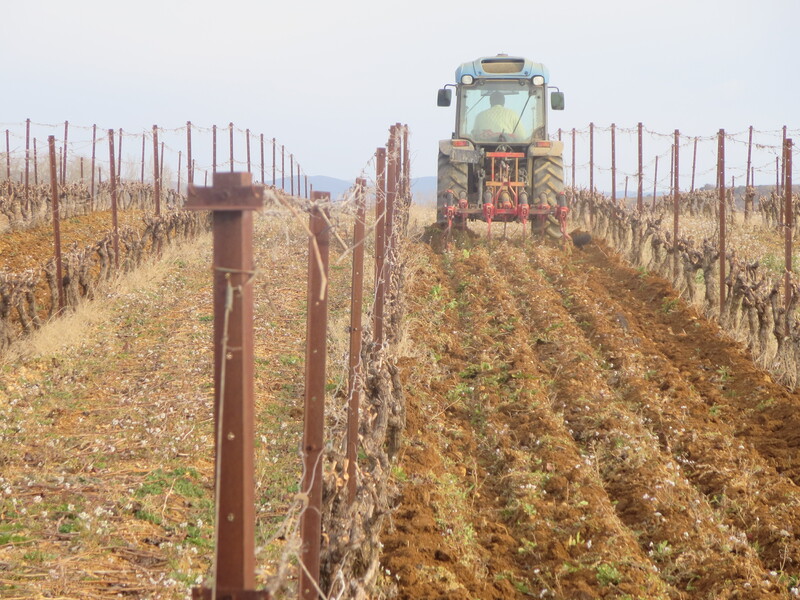 The other major task for March has been the preparation of the palissage, the wires which are used to support the vines as they grow later in the year. 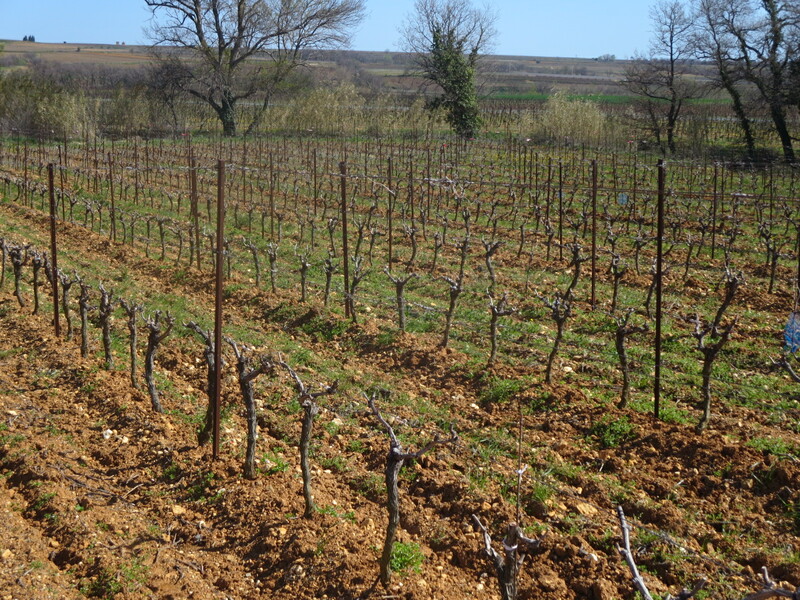 Gobelet vines are usually self supporting but many of the Syrah vines you see in the photographs above are cordon trained and will grow up the wires. 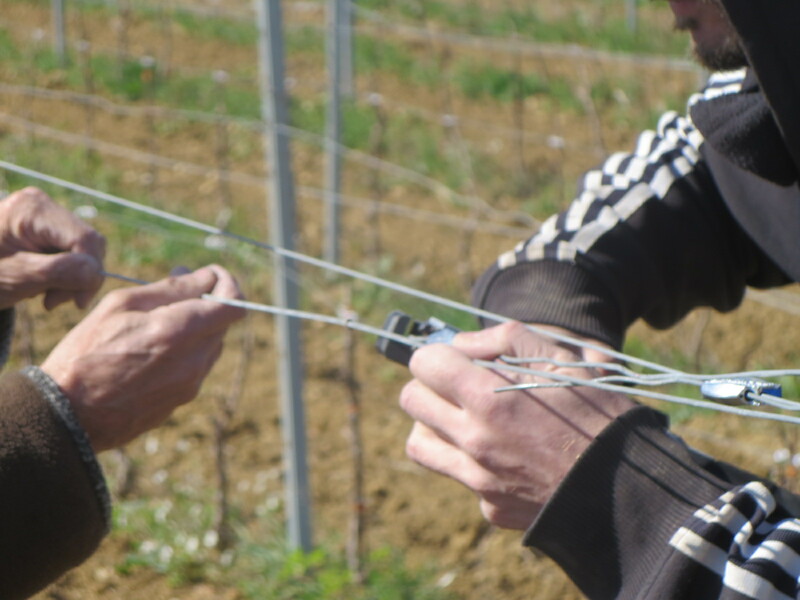 The weight of last year’s vines and the passage of winter means that the wires are sagging a little and need to be tightened for 2015. Michel and Renaud have been tackling this using a specialist tool but, believe me, this was hard work and happily I left them to it. Instead I enjoyed the wine tasting. Well it was March! Does seem dry from your photos. 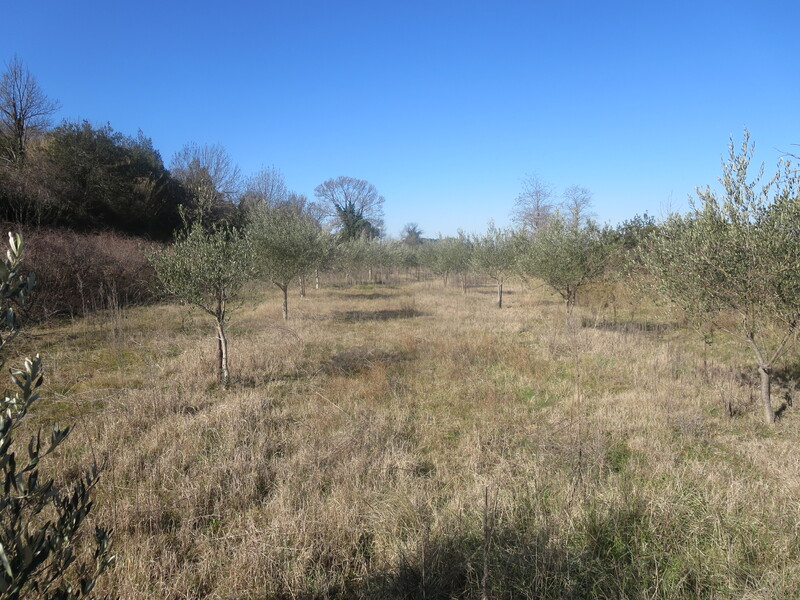 Round here (Hérault valley) there’s plenty of moisture in the soil and the early spring flowers, Irises and the like better than they’ve been for a few years. It’s definitely dry, high winds and lack of rain the last few weeks. It was damp enough a month ago to delay ploughing but the soil 15cm underneath was dry even then. There are flowers etc but Jeff said the oliviers are definitely unhappy. We have seen some gorgeous flowers and plants around here but the plain is clearly dry. Some of his neighbours have installed irrigation so probably turning it on.